In our last lesson we learned that authority means the right to rule. 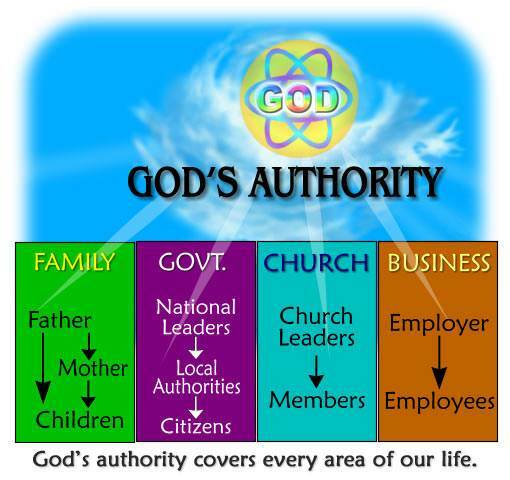 All authority belongs to God because He is the Creator of all things. We saw that the basic principle of the world is rebellion; whereas, the basic principle of God's children is obedience. We are here to obey God and uphold His authority. In this lesson we are going to learn a very important truth: We must obey God's delegated authorities in order to be fully obedient to God. 1. Direct authority. This means that God tells us directly through His Word or through His Spirit what He wants us to do. 2. 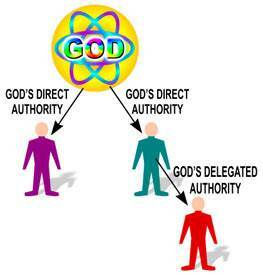 Delegated authority. 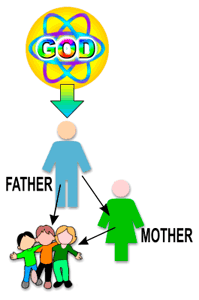 This means that God designates certain people to represent Him and to exercise His authority. God not only directs us personally, but He also directs us through His delegated authorities. 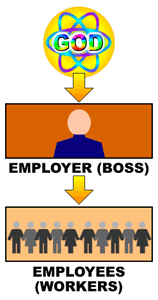 Some examples of people who are delegated authorities are: parents, school teachers, police officers, governmental officials. 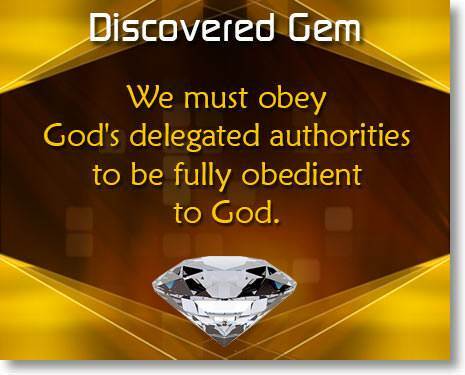 Since a delegated authority is a person who represents God's authority, he must be obeyed. To be disrespectful or disobedient to God's delegated authority is like being disrespectful or disobedient to God Himself. Let us consider each of these four structures of authority. If they ask you nicely in a way that satisfies you…"
But the young person who wants to please God will not consider these variations. Instead, he will choose to obey his parents because it is right to do so. Christians are to be law-abiding citizens. The student in school honors God when he obeys the rules of the school and shows respect to his teachers. He dishonors God when he does not do this. As followers of Jesus Christ, we are to live our lives by the principle of obedience. God's plan is that Christ be the Head of every church. 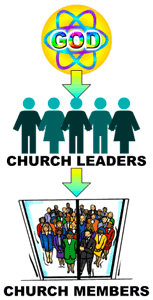 Under Christ are God-appointed leaders such as elders, pastors, deacons, and teachers. 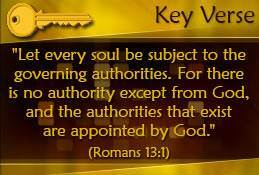 We are to be subject to God's delegated authorities in the church. Concerning our jobs, God wants every believer to work as though he were working for the Lord Jesus. A young man was having trouble holding his job. His attitude was not good and the quality of his work was such that his boss was displeased with him. One day his youth leader asked him this question, "Suppose Jesus Christ Himself was the manager of that store? Would that make a difference in the quality of your work?" He replied, "It sure would! I'd do my best all the time." You may have questions regarding authority. We will try to answer some of them. "Suppose that I think my parents are wrong about something. Do I still have to obey them?" The word "honor" means to respect and to obey. Even though you may disagree with your parents, do not be disobedient or rebellious. The person who does not honor his parents is not only breaking God's commandment, but he is also stepping out from under God's authority. The result of this is that his life may be cut short. 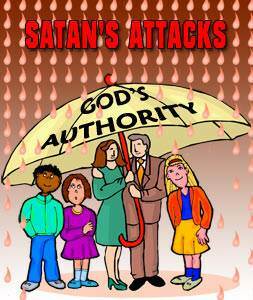 We can think of God's authority as an "umbrella" to protect us from Satan's attacks. Satan hates the people of God and wants to destroy them. But, so long as we are under God's "umbrella," Satan cannot touch us without God's consent. "Suppose the one in authority makes a wrong decision. Will I be held responsible?" The one who makes the decision is the one who is responsible for the results. If you are merely obeying the authority over you, God will not hold you responsible. Instead, He will hold the one in authority responsible for the mistake. "Suppose the one in authority has a bad personality and I don't like him. Do I still have to obey him?" Yes, you must be subject to him if he is in a position of authority over you. We must distinguish between a person's position and his personality. 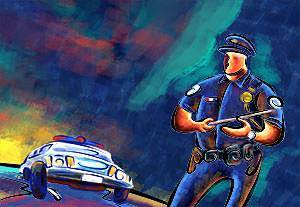 For example, a police officer is in a position of authority. He represents God's authority in upholding the law. He may not have a pleasing personality, but that does not excuse you from obeying his authority. If you received a ticket for speeding, you could not disregard it and say, "I got a ticket yesterday for speeding, but I tore it up because I didn't like that officer." "What if someone in authority commands me to do something which is contrary to what God has commanded?" This is a situation in which you are not to obey the one in authority. There is an illustration of this in the New Testament. Jesus had commanded His followers to preach the gospel to everyone. 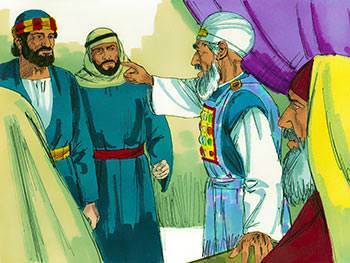 Later, the religious leaders commanded Peter and the other disciples not to preach or teach anymore in Jesus' name. Any time that man's command conflicts with God's command, you must obey God. For example, suppose your boss tells you to do something dishonest or to lie about something. To do this would be to disobey God's commands; therefore, you cannot obey. Even in an instance like this, you should be respectful. You should have a spirit of submission, even though you cannot obey. You should say quietly, "I'm sorry, but I cannot do that." Who of us would dare to disobey a direct command from the Lord? But do we realize that resisting God's delegated authority is disobeying God's command? To obey God's command, we must be subject to His delegated authorities. The Lord Jesus Himself is our example of what it means to be subject to authority. He was subject, not only to God's direct authority, but also to His delegated authorities. 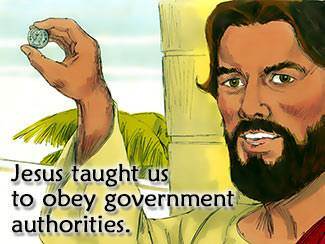 He was subject to His parents, He was subject to governmental authorities, He paid taxes, He was obedient to the laws of the land. Throughout His entire life, the Lord Jesus was subject to authority. He was never rebellious on any occasion. He truly lived His life by the principle of obedience.